Katja took her challengers to the final table, where Viktor managed to beat her with a hand of ace-ten. Deservedly – and not without some pride – he was then decorated with our “I beat a poker world champion” medal. First place this time went to Marc from Online-Marketing.de. The team will no doubt be celebrating the victory and the trophy. The standard of play topped the first Goodgame Studios poker night, and the ambitious participants showed impressive gambling talent. A second career at the poker table might not be out of the question for some. Of course, the game was not just for entertainment. There was ample opportunity to exchange ideas and discuss the latest online marketing trends over a selection of food and drinks. 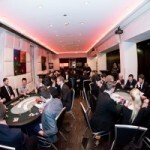 After the tournament, participants were networking late into the night in the glamorous setting of the casino. The roof terrace was somewhat uninviting this time round due to the bad weather, which is why we have scheduled the next poker night for late summer. 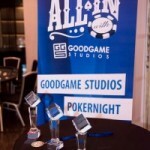 “All in with Goodgame Studios” has established itself as a regular event, and feedback from guests has been overwhelmingly positive.